RARELY SEEN THESE DAYS, this large equestrian painting in acrylic, as well as gouache & ink, on board has a multitude of titles, including Ghost Rider. Click on it for enlargement. 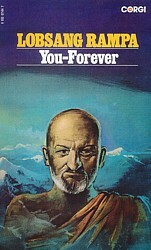 Pennington produced it as a personal project in the early 1970s around the time he did the New English Library cover for The Green Brain (1973). 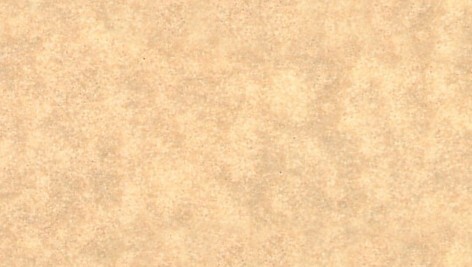 It was later reproduced as a greetings card (without message), as well as on the back of his own book Eschatus, both published by Dragon's World in 1977. Approximately two metres in height, it forms the showpiece of the Deane Collection in Brisbane, Australia, one of the largest collections of Pennington's work outside Britain. 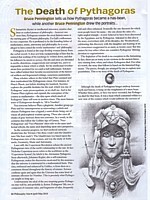 AN INTERESTING CHALLENGE for Pennington came along in 2010 when he was approached by another Bruce Pennington who had written an article about Pythagoras for Philosophy Now magazine. Would the artist be interested in doing a couple of illustrations? It so happened that he already had a portrait of Pythagoras drawn years earlier as one of a series of famous vegetarians. Interesting double coincidence. So he dusted it off and used the old drawing as a starting point for two new portraits of the philosopher as a young and old man. 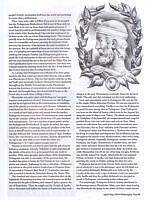 The illustrated article was published in the May 2010 issue of the magazine, as you can see below. 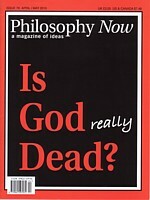 The end credit reads: "Bruce Pennington, the author of this article, is a math teacher living in upstate New York. 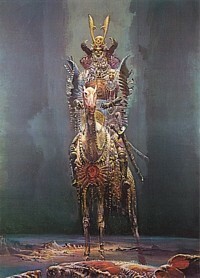 The portraits of Pythagoras are by another Bruce Pennington (unrelated!) who is a renowned sci fi illustrator living in Britain." The significance of the bean in the portraits is that apparently Pythagoras' vegetarianism included a prohibition on eating beans, on the grounds that they were as much living creatures as animals. Some versions of his death tell that when pursued by an angry mob incited by his enemies he submitted to death rather than escape through a field of beans. ONE OF THE PLEASURES of Science Fiction for Pennington is being able to indulge his abiding enthusiasm for flying saucers. Click on the picture below for a gallery full of them. 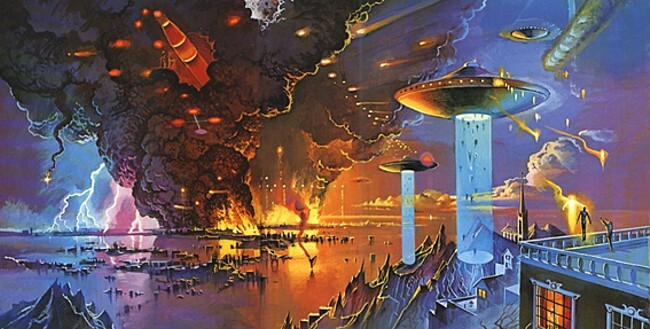 OF THE PICTURES BELOW Bruce Pennington says: 'Affectionately dubbed the "The Migraine Monochromes", these works are from a series of drawings I initially produced as post-Eschatus "therapy doodles", some of which developed into quite detailed dreamscapes with an almost etching-like quality to them. 'With my imagination fuelled by strong infusions of Tangerine Dream's music and other psychosonic influences, I did them quite often while recovering from bouts of migraine between 1976 & 78 when I was gradually pulling away from the gravitational "anxiety field" of Eschatus with all its schedules and commitments. BELOW IS A GALLERY of various experimental paintings Pennington has produced over the years. Only the first has been published as a black and white print in Book of the Vampire. IN HIS ROLE AS a predominantly book-cover artist, Pennington occasionally had the chance to portray some of the most notorious and controversial characters from the realms of the bizarre and supernatural. Here are three of them: Aleister Crowley, PT Barnum and Lobsang Rampa.